The Castlereagh catchment is part of the Murray-Darling Basin in central-western NSW. The Castlereagh is an unregulated river that has no major storages. Streamflows are highly variable, and the large sandy bed of the river often dry. The Castlereagh River begins in the Warrumbungle Ranges near Coonabarabran, and flows north-west for 549 kilometres to its confluence with the lower Macquarie River. The Castlereagh catchment is bordered by the Namoi catchment to the east and the Macquarie-Bogan catchment to the west. The Castlereagh catchment drains an area of 17,400 square kilometres with elevations ranging from 850 metres in the east, to less than 200 metres on the floodplains north-west of the catchment. The majority of the catchment's population lives in the major towns of Coonabarabran, Gilgandra and Coonamble, along the river. Smaller villages include Binnaway, Gulargambone and Mendooran. 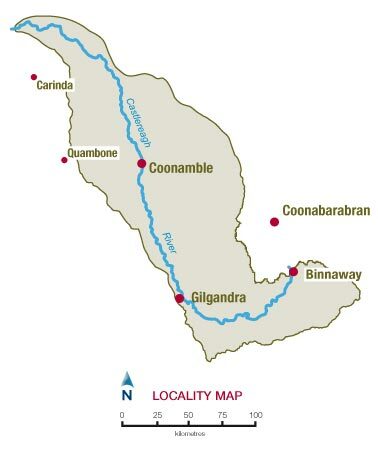 The Castlereagh River rises in the Warrumbungle Range and flows east to Coonabarabran, then south to Binnaway, before sweeping around to the north-west where it enters the Macquarie River north of Carinda. 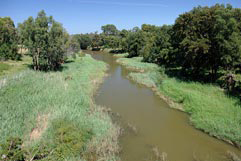 Downstream of Gulargambone, many smaller creeks and streams join the Castlereagh River, forming a floodplain that carries flows between the Castlereagh and Barwon Rivers during floods. View real-time data from the Castlereagh catchment on this website. Water is mainly used for stock watering and dryland agriculture. Grazing accounts for 63 per cent of land use, while dryland cropping and horticulture account for 20 per cent. Local water utilities are also an important water user, especially in the upper catchment. Town water supply accounts for 10 per cent of all surface water use and 43 per cent of groundwater use in the catchment. The Castlereagh is an unregulated river and has no major storages. Stream flows are highly variable and the river's sandy bed is often dry. Surface water in the river is highly connected to alluvial aquifers along the river bed. These aquifers are an important source of groundwater. Sharing water fairly between competing water users and the environment, within the extraction limits set by the Murray-Darling Basin Cap, is a key water management issue. Water sharing plans within the catchment seek to address this issue by setting long-term rules on how water can be accessed, used and traded. There are very few wetlands in the Castlereagh catchment. However, floodplain, woodlands and shallow wetland complexes occur on some of the effluents in the lower catchment. Goonoo State Conservation Area south-east of Gilgandra has important biodiversity values. It comprises the largest remaining area of blue-leaf ironbark forest in NSW and provides habitat for the endangered mallee fowl. To preserve water resources in river and groundwater systems for the long term, it is critical to balance the competing needs of the environment and water users. Water sharing plans establish rules for sharing water between the environmental needs of the river or aquifer and water users, and also between different types of water use, such as town supply, rural domestic supply, stock watering, industry and irrigation.